High quality, low cost moulding adhesive system. The overtec system is a low-pressure moulding process that uses thermoplastic moulding resin to achieve high quality sealing and protection of components, faster than 2 component potting resins and far lower capital cost than injection moulding. A process innovation positioned between casting and injection moulding technologies, the overtec system utilises a low injection pressure that means fragile or delicate components can be encapsulated and protected with no risk of damage. 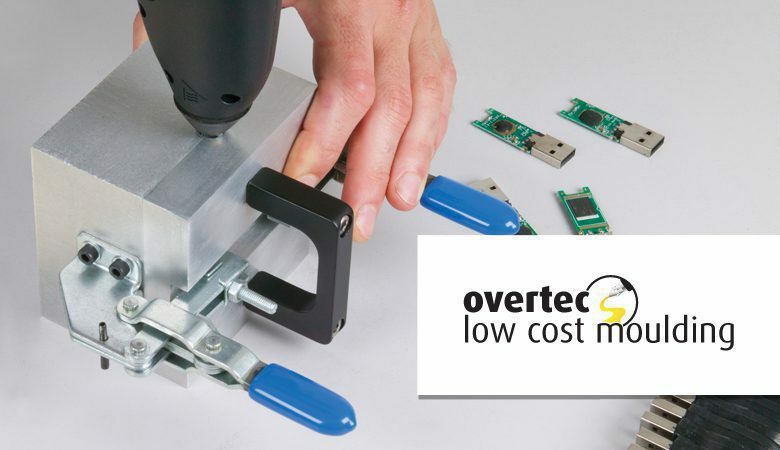 The overtec 5 FR resin sticks simply need to be loaded into the overtec 820-15 glue gun and allowed to reach operating temperature before use, resulting in a simple and clean process with fast cycle times. Overtec 5 FR is a high-performance moulding resin that is solvent free and composed primarily of renewable materials, making it environmentally friendly. There is no time consuming and wasteful mixing or shelf life issues. The properties of this material mean that it can offer water-tight encapsulation, water and chemical resistance, and excellent upper and lower heat resistance. The overtec low-cost moulding system eliminates the need for traditional housings and casings used in potting, it also saves energy by eliminating the heat curing process. There is no need for slow and wasteful 2-part potting or casting resins, meaning costs can be cut. Low cost tooling is made from aluminium which is easy to mill, drill and spark erode. It has good thermal conductivity meaning it is the ideal material from which to make the mould sets. Moulds made of aluminium usually have a long life-span, aided further by the lack of abrasive or corrosive ingredients within overtec 5 FR. These moulds cool the component quickly and allow easy release of the moulded pieces when the process is complete. Use of mould release sprays can further assist de-moulding.